There’s an episode in season three of Girls in which Alex Karpovsky’s Ray says to Shoshanna, “Cool cigarette.” He’s being sarcastic. It’s a great line. But Karpovsky is not such a self-righteous non-smoker in real life. (Thankfully, because those people are the worst.) “I personally don’t smoke, but I will have a cigarette once a month just to kind of remember why I don’t smoke,” he told us at last night’s premiere, hosted by the Cinema Society. “I tried it in college for a second and, you know, it makes me nauseous.” So why induce nausea once a month when you already know cigarettes make you nauseous? “I’m usually drunk and I forget.” His cigarette of choice, which he bums, is a Parliament “with the recessed filter,” but he says any brand will do, really. “The only thing I don’t like are American Spirits because you have to hang out with it for twenty minutes. 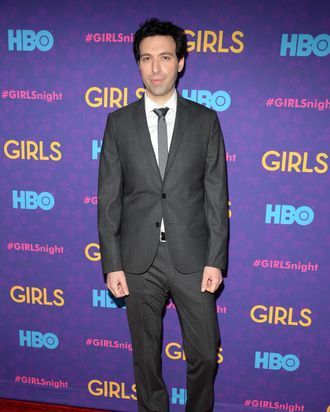 So I’m against that.” We’re grateful to have Alex Karpovsky back on the party scene, giving weird little tidbits about his personal life to reporters.